This Memorial Day weekend flew by. We got a lot accomplished, but not as much as we had hoped. I can't help but feel partly responsible. I had Friday and Monday off work, which is pretty rare. I celebrated by sitting around in my underwear until noon or so on Friday. I followed that up with my first post-marathon run, five miles easy. It went well. I had some tight muscles with a few aches, but no major injuries. I spent most of the afternoon mowing the lawn and doing other miscellaneous yard work. In the evening we went to Target to look at baby items. Saturday morning I mountain biked at Kickapoo with Gene and Greg. I haven't been there in a few months, so I wasn't quite at the top of my game. The trails were a little muddy, but not nearly as bad as they could have been. Gene and Greg took me onto the "new" section of trail, which was absolutely ridiculous. Most of the trail is challenging, but this new part was downright sadistic. The single track trail was very narrow (18"? ), cut into the side of a very steep hill, slanted downward, with tight and steep switchbacks. I made it through okay. Actually, it was dangerous. There, I said it. The rest of the trail pales in comparison. 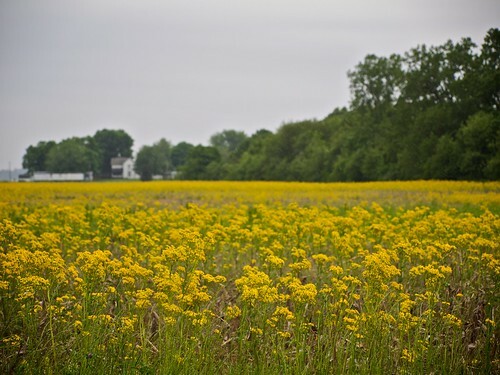 Many unplowed fields across Illinois and Indiana had bright yellow flowering plants (which I assume are weeds) this weekend. Saturday afternoon we drove to Indianapolis. First we visited Babies-R-Us to look at cribs and other various items. Next we went to Aimee & Brett's house to pick up a few baby items they wanted to give us. Then it was on to Aunt Jeanne's house to meet up with the family. 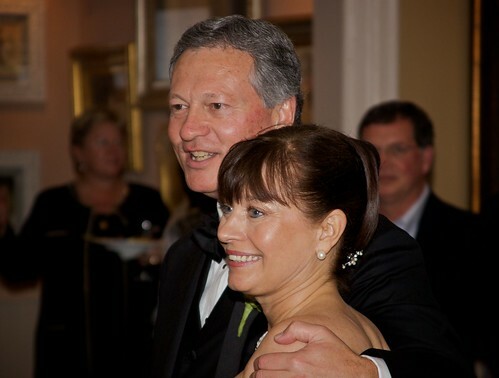 Finally, we went to Zionsville to my uncle Dennis and (new) aunt Sally's wedding reception (the main event of the trip). The reception went well, and it was great to catch up with the cousins, aunts, & uncles. Sally is a wonderful woman and she and Dennis seem very happy together. Sunday morning I got a little cleaning done in the office, but not as much as I (or Melissa) hoped. It's never as much as I hope. I also worked for a little while setting up one of my old computers for my grandparents in Bismarck. After lunch we went swimming (our first family swim). Then we went shopping for new stoves. We've been on the brink of getting a new stove since Christmas. I think it's finally going to happen this week. 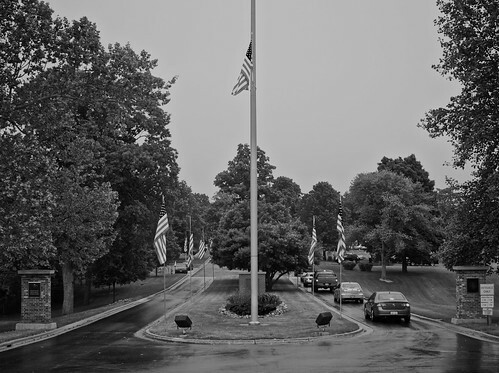 Monday morning I drove over to Danville for the Memorial Day 5K race at the VA. It rained during the race, which kept the temperature somewhat cool, but also made the roads a little slick. Right from the start a large pack of high schoolers shot out to the front. I tagged onto the back of the pack, maybe 12-15th position for the first half mile. I was running way too fast and I knew it. What were all these jokers doing? 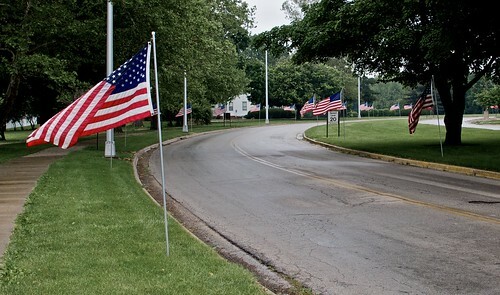 The 5K course followed the road around the VA, which was lined with flags for Memorial Day. The second half mile I slowed down, but all the kids around me slowed down even more. I moved my way up through the pack. I reached the first mile in 5:36. I ran mile two in 5:50, by which time I had moved into 4th place. My heart rate was through the roof and it was starting to wear on me. The last guy I passed tagged along behind me and stayed with me for the third mile. He passed me back with around a quarter mile left. My last mile was 5:55 and I finished in 5th place (out of a record 398 participants), 1st in my 30-39 age group. I was worried I might still be feeling the effects of the marathon eight days prior, but my legs felt perfectly fine. It was a tough race, mostly because I started too fast (didn't I just learn not to do that?). Well, racing a 5K is a world apart from racing a marathon. Incidentally, my heart rate hit 194 in the last tenth of a mile, which I believe is the highest I've ever recorded (my theoretical max heart rate is 195). After the race I went to visit my grandparents. They've been having some health problems recently and I hadn't seen them in a few months. They seemed to be doing fairly well, all things considered. My dad and I worked to get their computer problems straightened out. Then we had a pizza lunch before hitting the road. I drove my dad back to Danville in the new car, which he seemed to enjoy. Finally we spent this evening at a cookout with Cara & John at our house. John got a nifty remote controlled speedboat for his pond. Good times. I've been using the Twitter micro-blogging service for around 16 months now. I'm a fan. 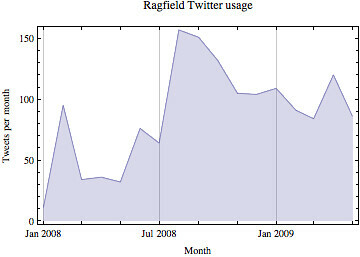 I've spent a bit of time recently data-mining Twitter (mostly work-related). I took a quick glance at my own usage patterns in this blog post. I'll spare you the mathematical details and provide the condensed version here. I've been using Twitter for 1 year, 3 months, and 21 days. I've posted 1487 status message updates (tweets). I've averaged 3.125 tweets per day. I've typed a total of 107,442 characters. I've averaged 72.25 characters per tweet (roughly half the allotted amount). My shortest tweet was "bed". I've used 19,188 unique words (18,528 if you don't count numbers). My most commonly used word is "the". I've used 7,883 unique nouns. 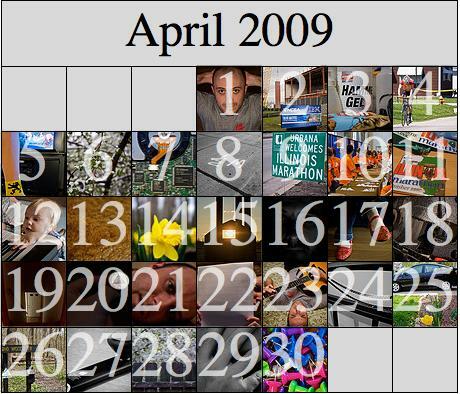 My most common topics are: bike, work, time, ride, think, run, like, morning, race, mile(s), home. I've used 4,300 unique verbs. My most common actions are: bike, work, ride, think, run, race, see, know. 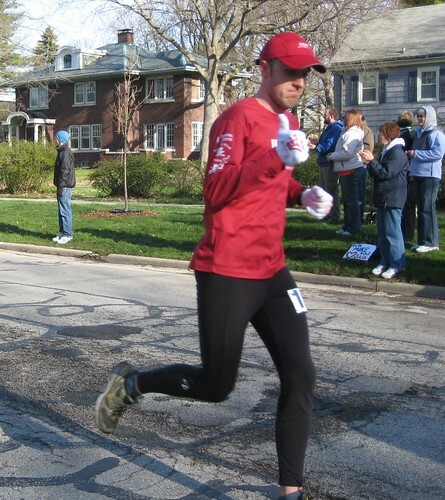 I found my performance at the Illinois Marathon to be unsatisfactory. I enjoyed terrific preparation, but suffered from poor execution. I physically recovered fairly quickly so I decided to do something unprecedented (for me) and run another marathon only five weeks later. This marathon would be different. It had to be. I had a plan. And I was going to stick to the plan come hell or high water. 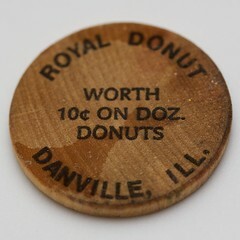 Melissa and I drove up to Rockford, IL on Saturday. 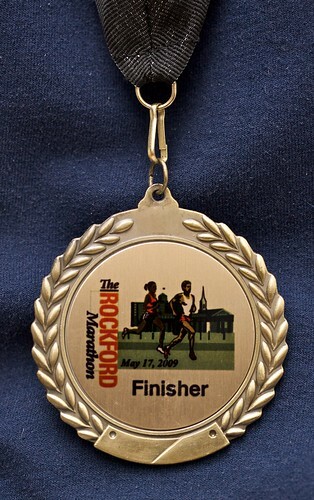 The Rockford Marathon was quite a bit smaller than the Illinois Marathon. There would be just a few hundred participants in the full marathon (as opposed to a few thousand), while several hundred more would run the half marathon. We battled heavy winds the entire trip. When we stepped out of the car at the packet pickup location I briefly forgot what month it was. In addition to the awful winds it was bitterly cold. We stayed with Melissa's sister, brother-in-law, and nephew on Saturday night. 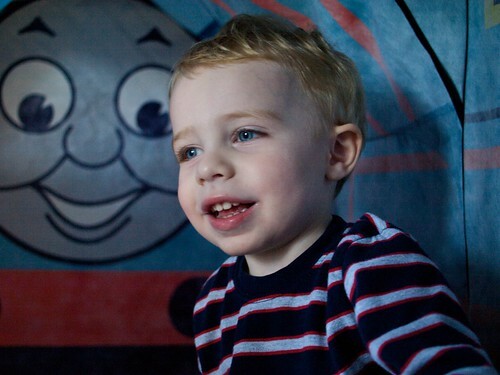 We had great fun catching up and playing with two-year-old Logan. The next morning I awoke a little before 5 a.m. I immediately checked the temperature, which read 35˚. This was going to be a long morning. I crept downstairs to eat a Clif Bar, two cinnamon brown sugar pop tarts, and a banana. Normally before a race my stomach is very upset, but not this time. I felt perfectly calm. I felt no pressure. This was a good sign. By the time we stepped outside I was pleasantly surprised to find very calm winds and the temperature didn't feel nearly as cold as I anticipated. I was concerned that it might be too cold to wear shorts, but it wasn't. We arrived at the race right on schedule. After a quick trip to the porta-potty it was time to start. 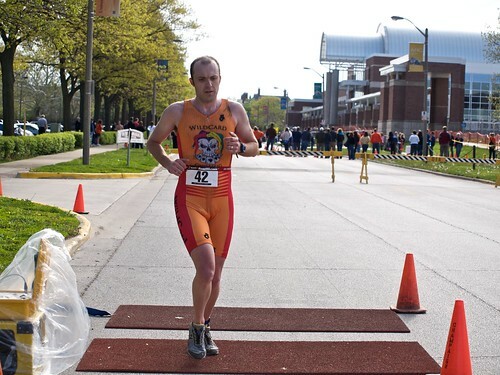 I wanted to finish with a time faster than I ran at the Illinois Marathon, but that goal was really secondary. My primary goal for this race was to run negative splits. This is the term used by runners to refer to a race when the second half is run at a faster pace than the first half. Running negative splits is easier physically, but it's much harder mentally. 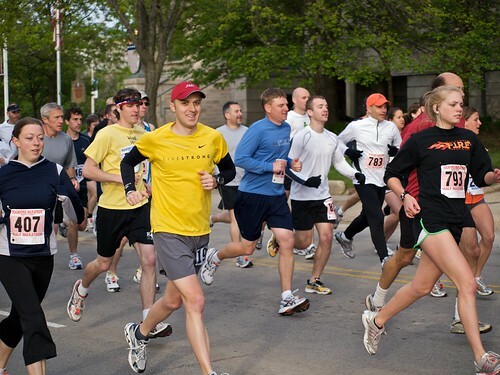 It takes a tremendous amount of discipline to pace yourself correctly in the early part of the race. I've been running competitively for 15 years and I've only been able to run negative splits in races just a few times... but these were my fastest races. My target pace would be 7:15 per mile with a goal finishing in 3:10:00. I wanted to start the race around 7:25 per mile. I positioned myself 5/8 of the way between the 6:00 per mile sign and the 8:00 per mile sign. Before I knew it we were off. 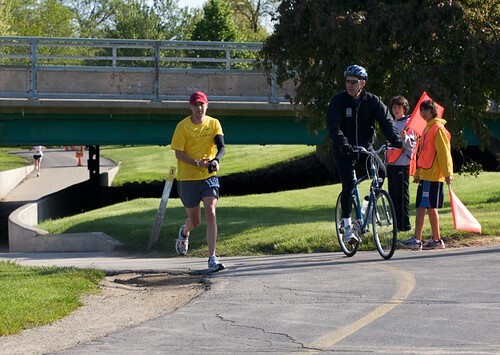 I wore a yellow shirt so Melissa could spot me along the course. Unfortunately, a few others must have had the same idea. I started very easy. For the first few blocks people were moving past me like I was standing still. 1/2 mile into the race I began to worry. They can't all be running too fast, can they? I felt like I was running way too slow. This can't be right. The first few miles of the Illinois marathon felt easy to me, but they definitely didn't feel slow. This felt both easy and slow. I breathed a sigh of relief as I passed the first mile marker in 7:24. It was exactly where I wanted to be. The first part of the race absolutely flew by. I was concentrating on breathing as easily as possible and running as efficiently as possible to save my energy. Around mile six, content with my easy start, I decided to pick up the pace a bit to hopefully start running closer to 7:15 per mile. I left the group I had been running with, never to see them again. After mile five not a single person passed me the remainder of the race. I can't begin to tell you what kind of a confidence booster that is. Incidentally, not a single person passed me in either of my previous two races. This streak can't continue much longer. I saw Melissa out on the course around mile 11. She was kind enough to take the arm warmers I no longer needed. It was turning out to be an absolutely gorgeous day. Neither too hot nor too cold, it was perfect running weather. By the half way point I had made up all the time I lost in the early miles. I was exactly on my 7:15 pace. Once the marathon runners split off from the half marathon runners I saw relatively few people. Most of the racers were in the half marathon. 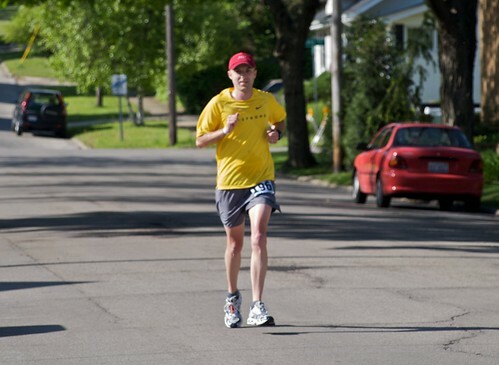 At several points in the last half of the marathon I would go minutes at a time without seeing another competitor. I saw Melissa again at mile 14 after flying down a fairly steep hill. I wouldn't go so far as to describe Rockford as hilly, but it's far hillier than Champaign-Urbana. To my pleasant surprise, despite very little hill training, I handled the rolling terrain with relative ease. Nothing went even remotely wrong until mile 15 or so when I began to notice a blister between the first two toes on my left foot. I ignored it as best I could, but the pain became worse and worse. I began to dread every step. By mile 16 or 17 I was fairly certain it was bleeding. Everything else was going so well, I wouldn't let this problem stop me. I ran through it and eventually blocked it out. After the race I discovered the very large blister had completely ripped off and my toes were quite raw. It will take a few days to heal, but I'm not worried. I couldn't believe how good I felt at this point in the race. Mile 16 & 18 were the two fastest miles I ran the entire race (mile 17 & 19 were good also, but they were slightly uphill). I kept going faster and faster. 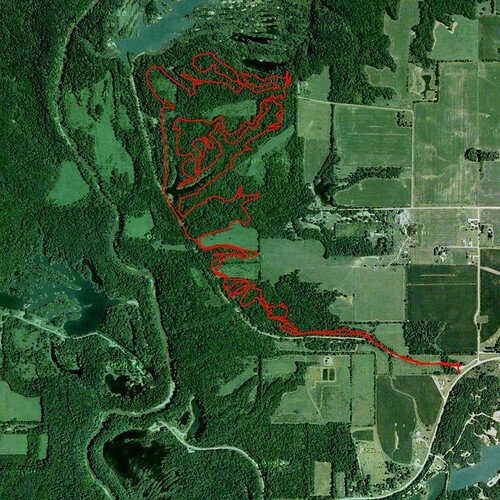 A slight hiccup came just after mile 22 when the course went onto a multi-use path through the woods. I ran for nearly a mile without seeing a single course marker, volunteer, or competitor. I had no idea whether I was still on the course and it was beginning to really freak me out. Did I just run this well only to screw up now? Luckily I was still on the right path. It was becoming harder and harder to maintain my pace. By mile 25 I cracked and could no longer hold my sub-7:15 per mile average. I still finished reasonably strong, but I definitely slowed down the last two miles. I crossed the line in 3:09:05. It was a 13 minute personal record for me. 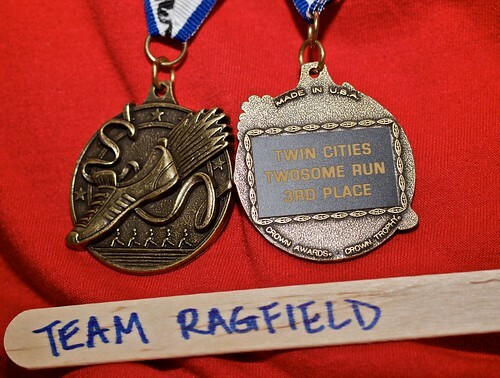 It was a Boston marathon qualifying time (the Ragfields are going to Boston). It was a negative split. Actually, I don't know my exact 1/2 marathon split so I'm not certain. It was only 3-5 seconds different either way (which is fairly remarkable if you think about it). I guess it would be better to describe it as even splits. I noticed when I crossed the finish line my timing chip didn't cause an audible beep. It had caused a beep at all the checkpoints, but not at the finish line. This caused me to worry. I had just run a Boston qualifying marathon time, but if something went wrong with the timing system it may not have counted. I tracked down a race volunteer who was able to check for me, and indeed the timing system did not register me when I crossed the line. Fortunately, they got it all straightened out and my time does appear correctly in the official results (actually, it took two tries to get it right... but they got it right). The race timers were very helpful in getting the matter resolved. Interestingly, since the marathon was so small (249 finishers), I ended up in 15th place overall and 3rd in my 30-34 age group. That was certainly unexpected. So that was the story my 2nd marathon this spring, my 4th road marathon, my 5th marathon, my 9th marathon or beyond. I ran faster than I've ever run for such a long distance. I did it at a very even pace (only 28 seconds difference between my fastest and slowest miles, compared to a difference of 3:03 at the Illinois Marathon). I felt better than I've ever felt in such a long race. And with any luck, I'll recover faster (the jury's still out on that one). I'll leave you with a brief comparison of my performances in these two spring marathons. My aerobic threshold is around 174 beats per minute. 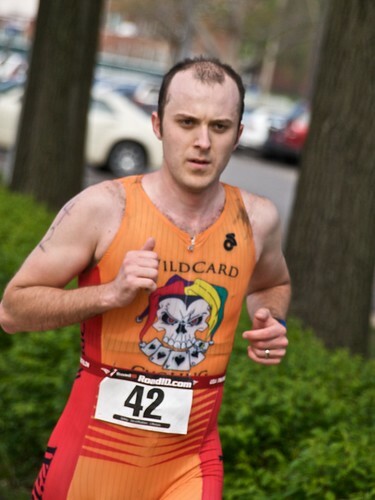 In the Illinois Marathon my average heart rate was 174 at mile 10. 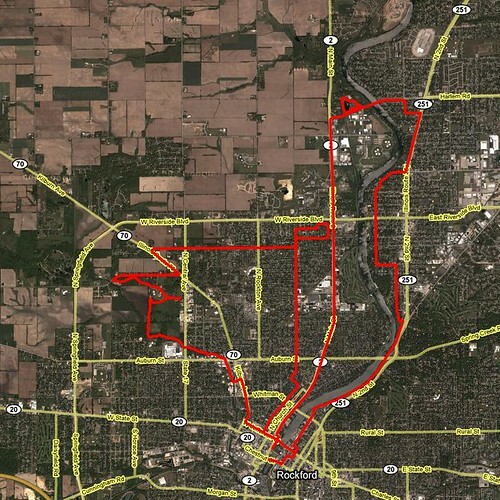 In the Rockford Marathon my average heart rate didn't hit 174 until mile 24. 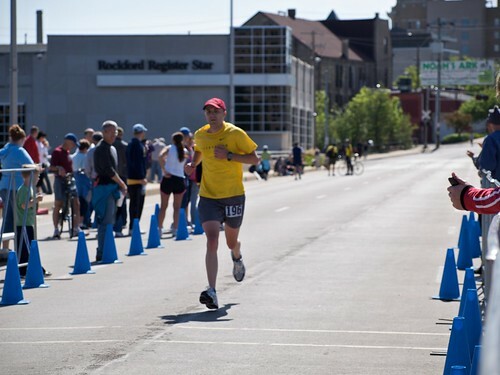 My legs hurt as bad at mile 15 in the Illinois Marathon as they did at mile 25 in the Rockford Marathon. I just can't get over the stark contrast between these two races when I had roughly the same level of fitness for both. If this doesn't convince you to run even-to-negative splits in a marathon, I don't know what will. Many thanks to Melissa for her awesome support and wonderful photos. 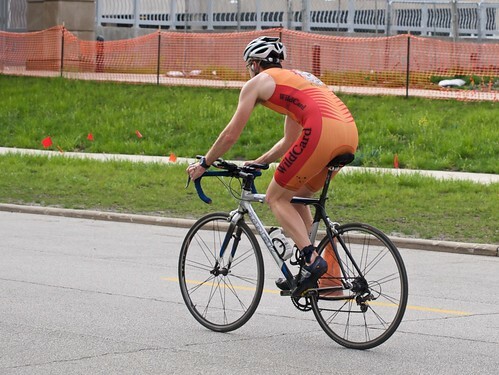 This morning I raced my first triathlon of the season. It's only been three weeks since the Illinois marathon, but I have recovered fairly well. I got some good training in this past week and I was ready for a fast race. Two of my Wild Card Cycling teammates (Martin and Scott) also participated. The swim took place in the indoor 50 meter pool at ARC. It's fairly common for early May triathlons to have a pool swim. As is typical for this type of race, each competitor starts individually, a predetermined time after the previous competitor. In this race the interval was 10 seconds. The start order varies from race to race. In the Champaign Mini-Tri (the only other triathlon I've done with a pool swim) the start order is based on race registration order. This means the people in front of you and behind you could be going either much faster or much slower than you and there is typically lots of passing that has to occur. This morning's race ordered participants by estimated swim time. When you register, they ask you to estimate your 300 meter swim time and that time is used to order the participants. If everyone estimates correctly, very little passing will be required. The first transition was fairly smooth. 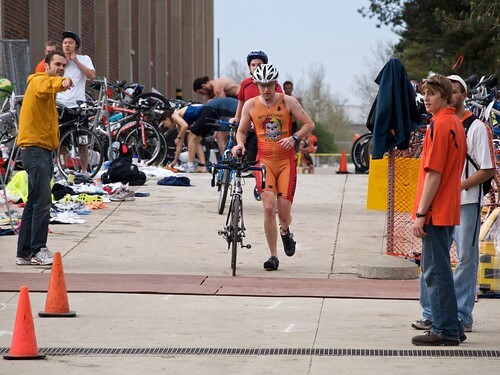 While running from the pool to the transition area, and then while running through the transition area to my bike I focused intensely on breathing easily to ensure my heart rate wouldn't be too high when I began the bike. The competitors were quite spaced out on the bike course. I flew along in the early miles, passing many other cyclists. My speed ranged from 24-27 mph. I was having a good day. Around the half way point we turned into a headwind and I slowed considerably. I had trouble maintaining 20 mph for three or so miles. I really struggled through that part. We turned again, but the wind wasn't much better. Then came a long shallow uphill section. The last half of the bike course wasn't fast. I was still passing other people, though they were fewer and farther between. I missed my two mile split, but it didn't matter. I couldn't have sped up and I wouldn't have slowed down. I raced all the way across the line, finishing in 55:05. My run split was 17:51 (the same time I ran at Tuesday's fun run), with the last two miles at 11:33 (5:46 pace!). This is 45 seconds faster than I've ever run in a triathlon before, and it turned out to be the 7th fastest run split. In a typical mass-start triathlon, you know your position when you finish (or very shortly thereafter). Since this race had staggered starts, I didn't know where I had finished... and I wouldn't know for quite some time. I was thrilled with my performance, and I felt great the entire race. 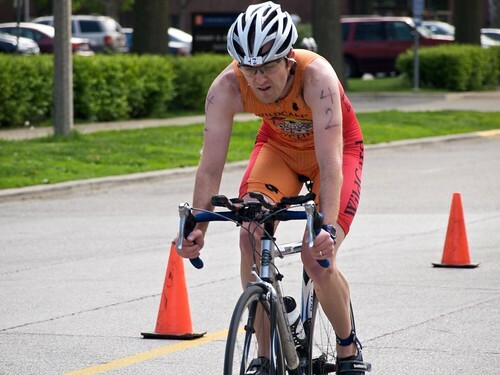 I passed two people during the swim, around 15-20 on the bike, and around 10-15 on the run. Not a single person passed me the entire race. That's never happened before. Frankly, with today's performance I would have expected to finish with a higher placing than I did (top five, or possibly even top three) for a race this size (380-ish participants?). The race simply had much better competition than I was expecting. Not bad for an inaugural event! 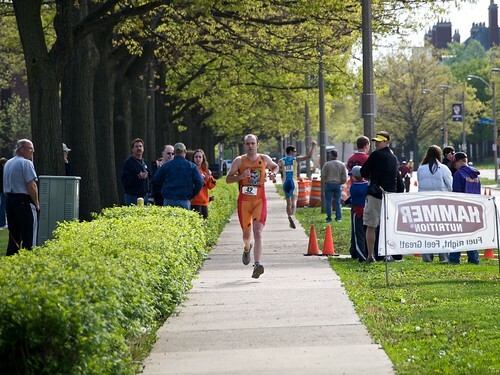 I'll also add that the 2009 Tri the Illini was incredibly well organized. Again, this isn't something I expected from a first year event. For many years I acquired (either inexpensively or freely) a lot of computer parts and other miscellaneous electronic equipment. I've been hanging on to these things just in case I ever needed to use them. I never needed to use them. 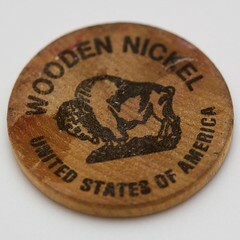 A lot of this stuff was sitting around for years at our old house. Then it was put into storage when we moved to Nicaragua. Then it was moved into our new house. Close to two years later it still hasn't been used. So it's time we parted ways. 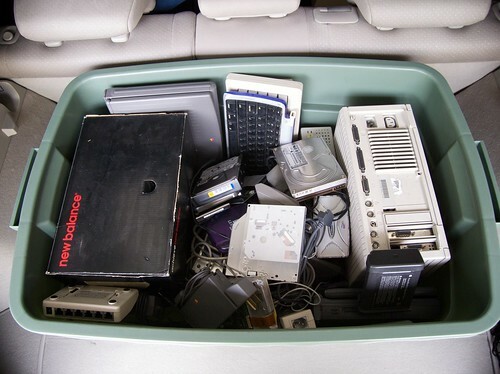 Today was the annual free electronics recycling event in Champaign-Urbana. Over the past few weeks I've been cleaning out my office so I could take this stuff to be recycled. 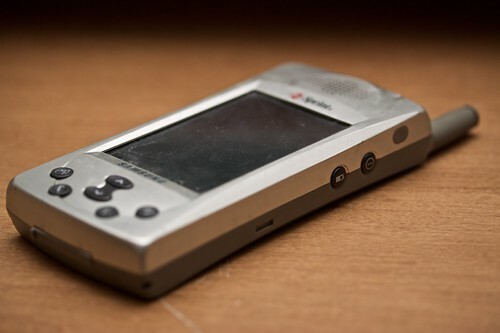 Of note, the box contained my first PDA (a Palm iii) and my first smartphone (a Samsung SPH-I300). 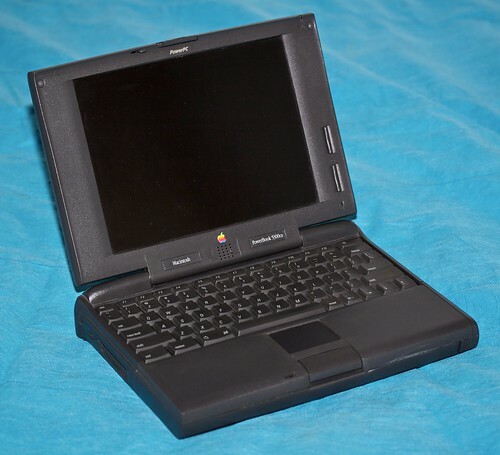 The most sentimentally valuable obsolete item in the box was my old PowerBook 5300cs. This was my second computer and my first laptop. I got it in the fall of 1996 and used it regularly until the fall of 2000, when its duties were usurped by my work-issued PowerBook G3. 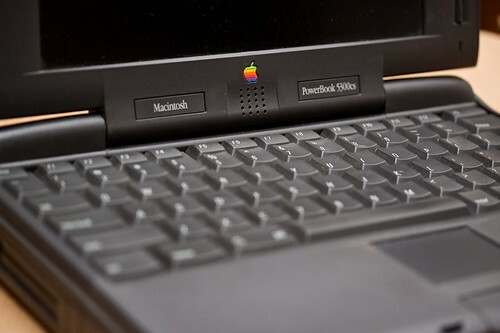 Everyone has a laptop now, but in 1996 it was somewhat rare. I took it to most of my college classes to take notes (I can type way faster than I can write). Being the only person with a laptop in a lecture hall with hundreds of students meant that I stood out like a sore thumb, but I didn't particularly care. One funny story about this laptop occurred in the summer of 1998. I was finishing up coursework for my Math 285 class (differential equations) while I was working for ASP in southeastern Kentucky. I must have tripped over the power cord or something, because the power connector inside the laptop broke off from the motherboard. I had course work that had to be completed (using Mathematica, on my laptop) by a certain date... and I had about two hours of battery left and no way to recharge the battery. I used what precious little battery power I had left to connect my external modem to the internet via a long distance phone call. I shopped online for 20-30 minutes until I found a replacement part that would solve my dilemma (an expansion bay power supply). I ordered it and received it a few days later via FedEx. I completed my work and received an A in the class. This computer and I have been through a lot together.